africa, africans, biology 101, biology and behavior, biology matters, cameroon, cameroon western highland groups, different peoples is different (duh! ), emmanuel todd, flatlanders, individualism, individualism-collectivism, mating patterns matter, nationalism, outbreeders, polygamy, relatedness matters, the bamileke, voluntary associations, what's this hbd business all about anyway? been meaning to do a follow up post on the bamileke of cameroon since … well, since last november! always on top of things here at the hbd chick blog. (*^_^*) so, at long last, here we go…. oh. in case you don’t recall or didn’t realize, i’ve been trying to track down other outbreeders around the world — populations which have avoided close relative marriage (closer than second cousins) over the long term (say 30 or 40+ generations) — to see what they’re like: what their family structures are like, what their social structures are like, if they’re corrupt or nepotistic or have a lot of infighting between families/clans, etc. i’m interested in finding out if there are any general behavioral traits common to outbreeders. same for the inbreeders, too, actually. the bamileke, however, like many african groups, practice polygamy which probably narrows the genetic relatedness in the population. i don’t have any figures on how much polygamy is practiced there. so, it could be that the bamileke are long-term outbreeders (because they originally came from a flatlander region) who transplanted themselves into more mountainous regions beginning ca. four hundred years ago. they don’t seem to have adopted a mountaineer economy — pastoralism for instance — but, rather, stuck to farming. what might have (ironically) saved them from eventually having to adopt pastoralism was the arrival of the germans who introduced coffee growing to the cameroon highlands. 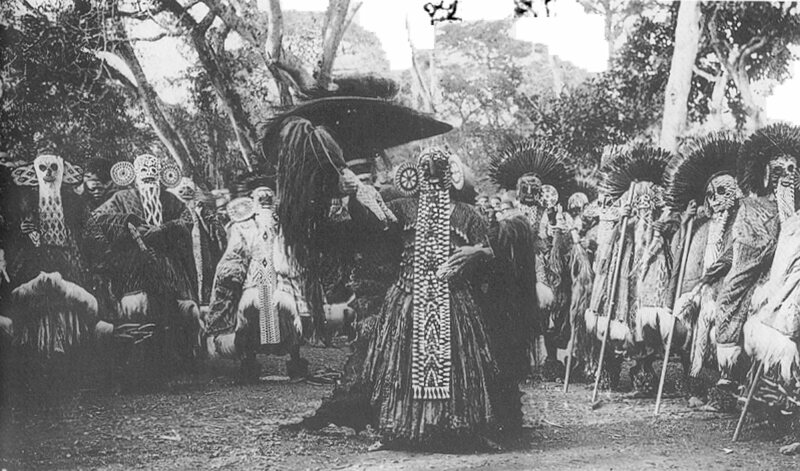 the bamileke quickly adopted the cash-crop system of coffee growing and trading with europeans. not sure about this, though — just a guess on my part. it might be impossible to reconstruct the history of the bamileke people’s mating patterns from historical records (which will have been written almost solely by europeans, of course). if i find any published accounts by christian missionaries in cameroon, they might include some info on the bamileke. otherwise, genetic data (runs of homozygosity) would probably be the best way to discover how in- or outbred the bamileke are. for now, all i can say is that currently (in the twentieth and twenty-first centuries) the bamileke are outbreeders. and judging by their history, there’s a good chance that they’ve been outbreeders for a few hundred years, but that is just speculation on my part. having said that, what are the bamileke like? what are their family types and social structures like? traditional bamileke families do not appear to have been nuclear families, primarily because polygamy was (is) practiced, so that is unlike the outbred societies we’ve seen in western europe. these features — not having tight clans or even lineages, individuals having to take responsibility for their own actions — are very much like what we see in the long-term outbreeding european populations. don’t know if the rest of the bamileke are like the bangwa in these regards, but i’m guessing yes, since i haven’t read any descriptions anywhere of bamileke peoples engaging in blood feuds or having a wergeld-like system. this absence of tight clans/kindreds seems outbred to me. so larger kinship groupings are not totally unimportant to the bamileke. “Although the group solidarity of the Bamileke is strong, individual achievement is highly valued. Members of the group are expected to exercise individual initiative in the pursuit of economic goals. Individual acquisition of economic resources including private property, money, and other remuneration is stressed. Other cultural characteristics of the group that have been invaluable to their entrepreneurial skills are discussed below…. “[T]he social status of an individual in this ethnic group is not rigidly fixed; individuals — male or female — can improve their condition in life and are expected to do so. Commercial and business success is one of the most highly valued routes to prestige and status. Bamileke women are also expected to achieve economic and comnercial success and there are few traditional limits placed on their economic participation…. “The traditional values of the Bamileke stress individual competition and overt displays of ‘getting ahead’. Individual Bamileke are expected to compete and to surpass each other’s accomplishments. The emphasis on competition is not limited to economic activities, but is a feature of personal relationships as well: within families, children are expected to compete with their siblings; sons and daughters are encouraged to surpass the achievements of their parents…. “A final feature of traditional society which must be noted is the system of succession and inheritance. Of all the elements characteristic of Bamileke social organization, this feature has been fundamental and has had far-reaching implications for the rate and pace of Bamileke participation in economic growth, development, and change. Succession and inheritance rules are determined by the principle of patrilineal descent. According to custom, the eldest son is the probable heir, but a father may choose any one of his sons to succeed him. An heir takes his dead father’s name and inherits any titles held by the latter, including the right to membership in any societies to which he belonged…. The rights in land held by the deceased were conferred upon the heir subject to the approval of the chief, and, in the event of financial inheritance, the heir was not obliged to share this with other family members. The ramifications of this are significant. First, dispossessed family members were not automatically entitled to live off the wealth of the heir. Siblings who did not share in the inheritance were, therefore, strongly encouraged to make it on their own through individual initiative and by assuming responsibility for earning their livelihood…. 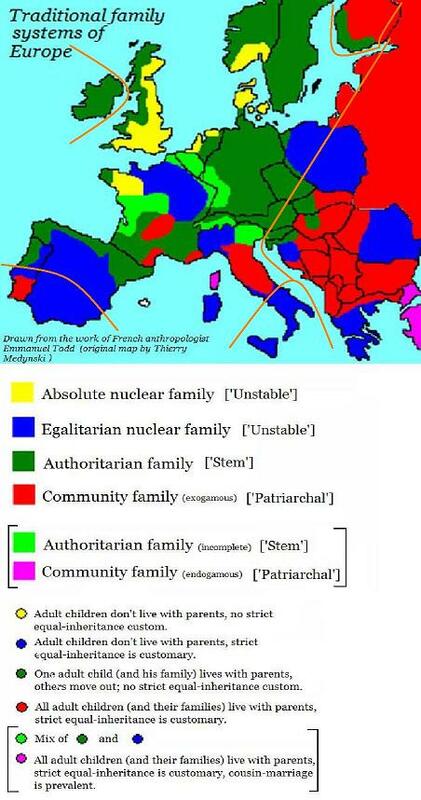 so here we have: individualism, extended family NOT being able to automatically rely on other members of the extended family, no precise inheritance rules (which is something emmanuel todd identifies as a trait of absolute nuclear family societies), and the collective unity of the larger group (NOT any family group). these are all traits that are found in outbred, “core” europe — although they are expressed somewhat differently in northwest europe vs. cameroon. i haven’t found out anything yet on corruption in bamileke society — although there seems to be plenty of it in cameroon. can’t imagine that they’re very nepotistic since the members of extended families are not obliged to help one another out — nor is aid to be expected — but you never know. i will endeavor to find out more! "core europeans", because there's more to hbd than just iq, because there's more to hbd than just racial differences, biology 101, biology and behavior, biology matters, civic society, civicness, collectivism, corruption, corruption perceptions index, different peoples is different (duh! ), emmanuel todd, europe, europeans, family types, finland, finns, general theory of the west, germanic peoples, hajnal line, homicide, human accomplishment, individualism, individualism-collectivism, iq, manorialism, mating patterns matter, medieval europe, relatedness matters, thank you!, the outbreeding project, tl;dr, violence, what's this hbd business all about anyway? i thought i’d do a big summary post on the hajnal line, just to have everything in once place. (^_^) sorry, there is no tl;dr, so go get yourself a cup of coffee. i’ll wait here. 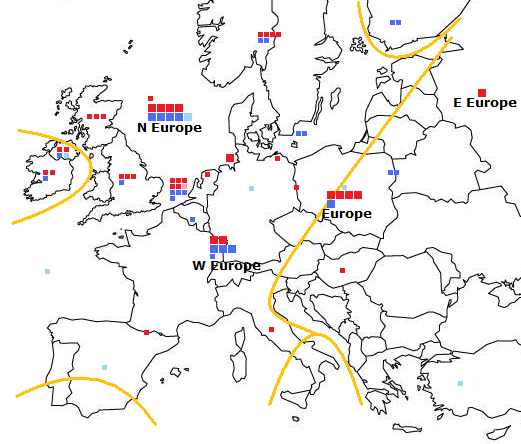 anyway, more from wikipedia: “The Hajnal line is a border that links Saint Petersburg, Russia and Trieste, Italy. 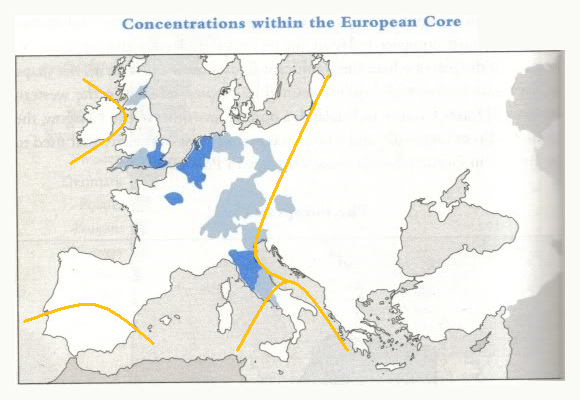 In 1965, John Hajnal discovered it divides Europe into two areas characterized by a different levels of nuptiality. 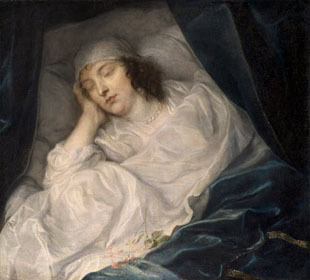 To the west of the line, marriage rates and thus fertility were comparatively low and a significant minority of women married late or remained single; to the east of the line and in the Mediterranean and select pockets of Northwestern Europe, early marriage was the norm and high fertility was countered by high mortality. so, the two big things that hajnal discovered: late marriage common in western europe plus a lot of individuals never marrying in western europe. hajnal’s original article on his line — “European marriage pattern in historical perspective” — was published in 1965 in Population in History: Essays in Historical Demography. at first glance, the most obvious explanation would seem to be simply that these are all germanic populations to some extent or another. 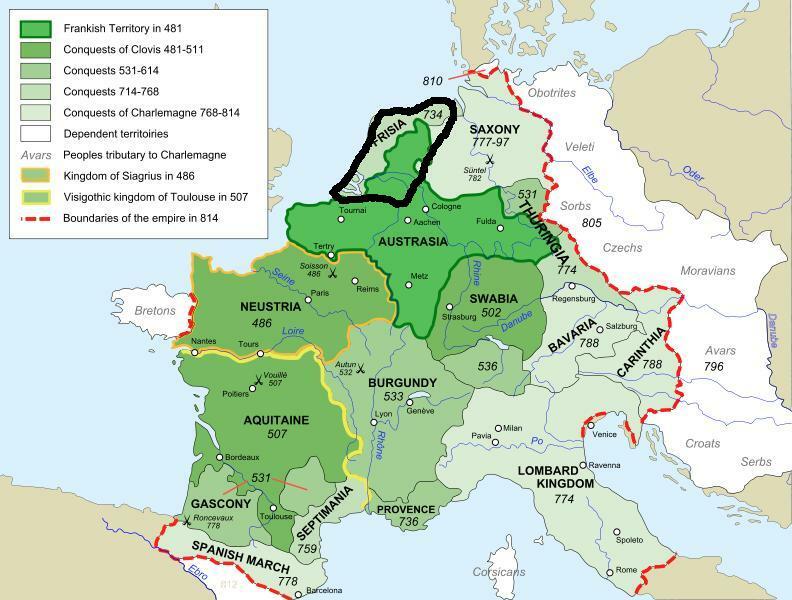 we’ve got the franks and co. in france and the low countries, the visigoths in northern spain, the langobards (and others) in northern italy, the swiss, the austrians, the scandinavians, and the peoples who became “the germans” in germany after they reconquered those areas during the ostsiedlung. and maybe that’s it. maybe that’s the whole story. i don’t think so, though, although it’s likely a part of the story (perhaps even a big part, i dunno). why don’t i think that’s the whole story? well, first of all, despite what you might’ve heard from tacitus, the pre-christian germanics did not marry late. going by the archaeological evidence (i.e. the types of grave goods found associated with girls aged around twelve to fourteen), it appears that pre-christian germanic women married young — probably right around the time they hit puberty. not sure about the men, but the case of the females indicates that hajnal’s line does not extend back into pre-christian times. odds are, too, that, like in most other societies in the world, the majority married, but i have no evidence for that either way. there are also no indications that the pre-christian germanics were particularly bright. they didn’t build any aqueducts anyway. it’s also unlikely that the pre-christian germanics were particularly oriented towards the broader commonweal either. pre-christian germanic society was, as i said, structured around the extended family, or the kindreds, and blood-feuds between kindreds were common (and legal). in any other society that i know of which is structured like that — like afghani society today, for instance (although there they have even tighter clans — the germanic kindreds had a looser configuration) — the members are not interested in the common good. they are interested in their extended family’s good. that’s it. in such societies, too, individualism usually runs second to collectivism — again, that’s a collective attitude toward the extended family, not the broader society. not sure how much individualism there was in pre-christian germanic society. still need to find that out (if possible). 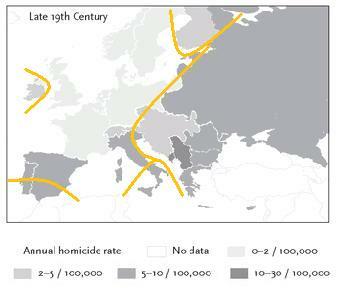 finally, the violence/homicide rates in pre-christian germanic societies were undoubtedly high. the omnipresent blood-feuds — not to mention all of the whopping great germanic swords and the seaxes — indicate that this was probably the case. the historic evidence for the existence of the hajnal line goes back to the 1500s, but no one’s quite sure when the pattern first emerged. the only thing that’s clear is that it was sometime between the introduction of christianity to the germanics in northern europe (which started in something like the 400s) and the 1500s. yup! 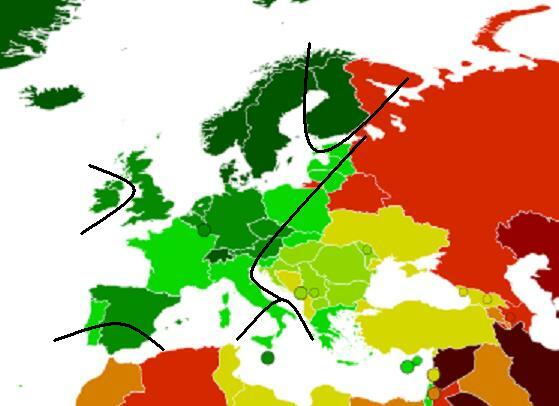 looks pretty much just like the hajnal line. manorialism is important for at least two reasons — and probably many more that i haven’t thought about. firstly, the whole system was based on nuclear families. in the bipartite manor system, peasants or serfs or whomever (depending on time and place in western europe) lived on and managed their own farms (let out to them by the manor owner) and also worked on the manor or paid rent to the manor. extended families very much did not fit into the manor system as it operated in western europe (there was a different development in eastern europe where extended families were very much part of the package). so manorialism — at least western manorialism — “pushed” for the nuclear family. 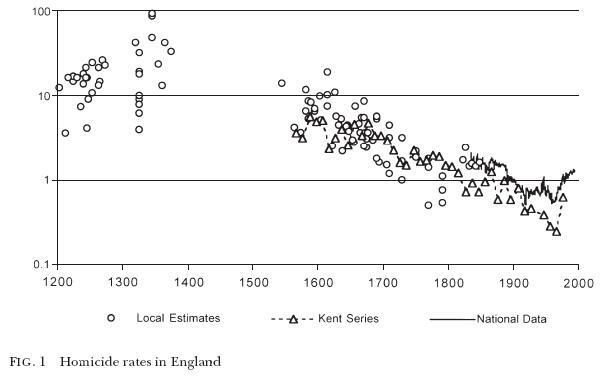 as early as the 800s in northwestern france, families that lived and worked on manors were very small, most often being only two generations (parents and children) and occasionally including a grandparent. 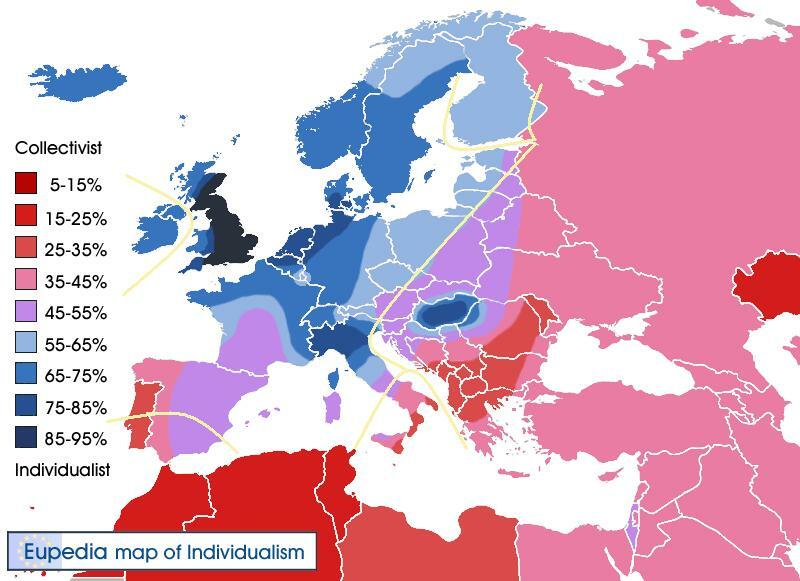 so, because the populations in peripheral europe missed out on manorialism, they also missed out on the “push” for nuclear families and the more stringent enforcement of the cousin marriage bans. medieval christianity weakened the old patrilineal clannish (or kindred-based) systems because it insisted upon the avoidance of cousin marriage which reduced the genetic ties between extended family members and set the stage for the selection of very different behavioral patterns in parts of northwestern europe — “core” europe. orthodox christianity in eastern europe also banned close cousin marriage, but this came later in that area of the world (since they adopted christianity later), and enforcement was not as firm as in the west — the secular regulations on marriage in medieval russia, for instance, flip-flopped several times and do not seem to have backed up the orthodox church’s canon laws as consistently as secular authorities had tended to do in the west (see here and here for example). and, again, the manor system was a very late arrival in eastern europe, and in many places it was not a bipartite system based upon nuclear families. 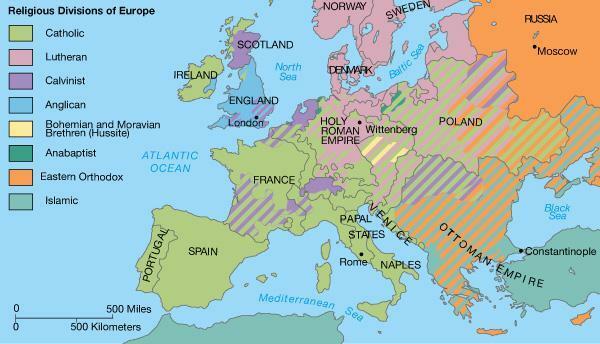 the eastern european extended family networks were incorporated into the manor system which developed there, because the extended family had never been broken apart in the east, since the cousin marriage bans were adopted at a later point in time and were not as strongly enforced. the long-term outbreeding of northwestern europeans, which began in the early medieval period, resulted in a new social environment for these populations. gone were the clans and kindreds, gone were the extended families, gone was the close genetic relatedness between extended family members (in inbreeding societies, the probability that first cousins share genes [alleles] in common can be nearly double of that in outbreeding societies). this was all replaced by a society based upon individuals and their nuclear families — and each of these “new europeans” were more unique genetic individuals than those in more inbred societies who share more genes in common with their relatives. with a new environment — in this case a new social environment — comes new selection pressures. the question to ask with regard to these big changes in medieval western europe is who succeeded in this brave new world? what sort of individuals managed to do well in life and reproduce successfully? the most. 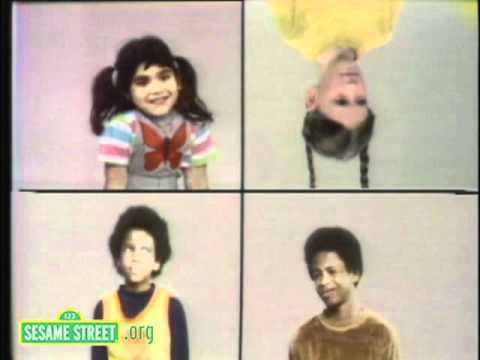 what sorts of personality traits did “the fittest” have? intelligence levels? behavioral patterns? what sorts of genes got selected for in this new environment? the new patterns of genetic relatedness between individuals would’ve (i think) changed the speed at which alleles for different sorts of behavioral traits — especially those related to altruistic behaviors — might’ve been selected (see here for example). in a long-term outbreeding society, it might pay to be altruistic towards two brothers or eight cousins, but if you’re from a long-term inbreeding society, you might only need to be altruistic towards four or five cousins to achieve the same genetic payoff. and, if you actually are altruistic towards the full number of eight cousins, whatever “genes for altruism” that you and your cousins carry will be selected for faster than in an outbreeding society, since you all carry more copies of them than outbreeding individuals do. in the societies outside the hajnal line, then, where the populations experienced, to differing degrees, more long-term inbreeding than those inside the hajnal line, people continue to favor their family members (or those whom they consider “one of theirs”) more. such behaviors continued to pay — genetically speaking — for longer, so these “altruistic” behaviors never got weeded out of those populations — or not so much anyway. therefore, the individuals in populations outside of the hajnal line tend to exhibit innate behaviors that favor themselves as members of extended families as opposed to favoring themselves as individual players in a broader community. this common thread of favoring the family (and/or intimate allies) can, i think, explain the common characteristics of societies that are outside the hajnal line: being comprised of large, tightly-knit extended families; having low average iqs (because individuals don’t have to fend for themselves as much? ); having less democracy, less civic-mindedness, and greater amounts of corruption (including nepotism) since everyone is more oriented towards their own than to unrelated strangers; and having higher homicide rates. on the other hand, what sorts of traits would’ve been selected for in individuals in long-term outbreeding societies where there would’ve been less of a genetic payoff in being altruistic towards extended family? i think you would (or could) have greater selection for individuals having behavioral traits which drive them to contribute more to the broader community. since the payoff for aiding extended family was no longer so great in “core” europe after many generations of outbreeding (i.e. avoiding close cousin marriage), it might’ve begun to pay equally well — or well enough — to aid non-family members (rather than extended family members) — to cooperate with them in the hopes of receiving aid back. in a society where one doesn’t have an extended family to fall back on, it might be very useful to possess traits which enable the successful collaboration with non-family — being trusting and trustworty, for instance. a society of such individuals might very likely: be comprised of small-sized families; have a higher average iq since individuals had to fend for themselves more; have more (liberal) democracy, more civic-mindedness, and less corruption since everyone would be more oriented towards the commonweal and not towards their extended family members. homicide rates would be low, too. outbreeding began earliest in this region as did manorialism, and both radiated out from this central core mainly to the south and east. 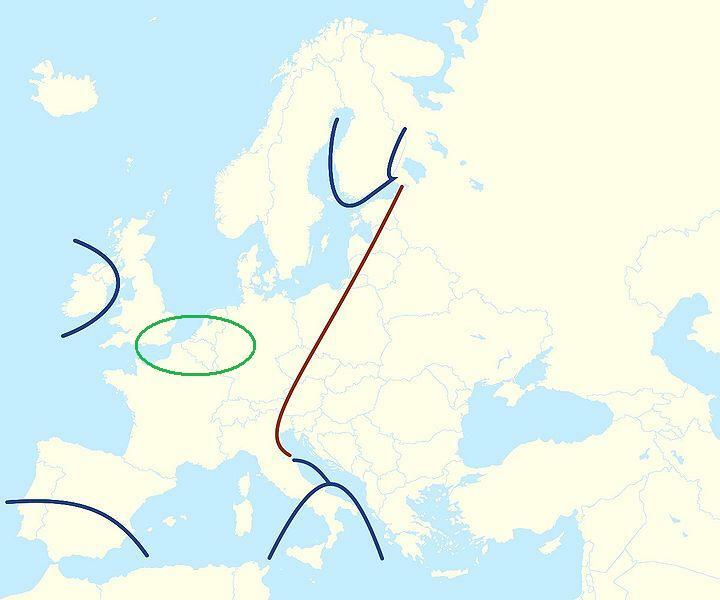 my bet is that there exists a gradient or clinal(-like) spread of whatever genes (alleles) are connected to the civicness behavioral traits belonging to the long-term outbreeding western european populations and that that spread starts in and around the area of the green circle (if the theory is right at all, that is! (~_^) ). so, apart from indicating patterns of nuptuality in late medieval and modern europe, hajnal’s line also represents the extent of both manorialism and The Outbreeding Project on the continent. both of these together set up a very new and different sort of social environment for western europeans — a new, and quite unique, social environment which exerted some very different sorts of selection pressures on the populations, particularly on social behaviors, but perhaps on other traits as well. i’ve been wondering lately what sorts of selection pressures the manor system on its own might’ve had on the population. time preference might be a big one — and this is where all of the late marriage comes in. couples often had to wait for a small farm to become available on a manor before they could marry and begin having kids. those who could wait may very well have been more successful than those who couldn’t (and who would’ve been shipped off to monasteries and nunneries for their lack of chastity). perhaps higher iq individuals, who could successfully manage their own farms as part of the manor system, also did well. update 03/12: see also Rise of the West and the Hajnal line from mr. mangan, esq! see also: How Inbred are Europeans? from jayman. 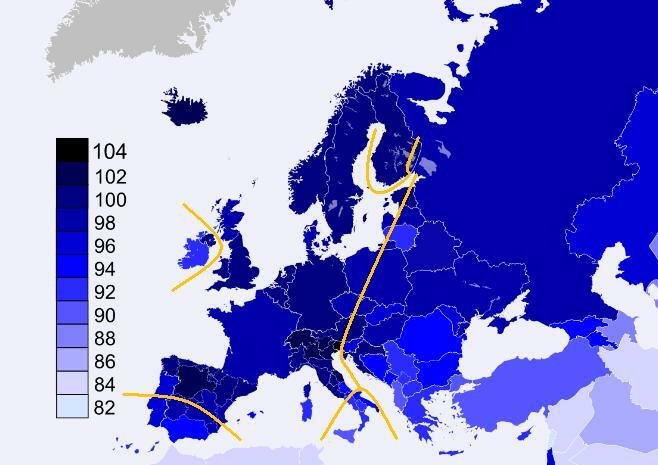 previously: the hajnal line and todd’s family systems and the hajnal line and behind the hajnal line and “core europe” and human accomplishment and civic societies and civic societies ii and national individualism-collectivism scores and historic european homicide rates…and the hajnal line and outbreeding, self-control and lethal violence and medieval manoralism and the hajnal line and more on the origins of guilt in northwestern european populations and whatever happened to european tribes? 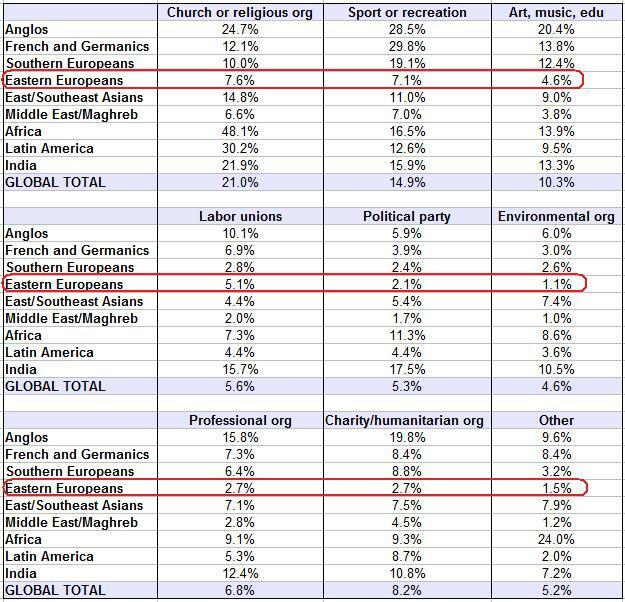 also, please see the “mating patterns in europe series” below ↓ in left-hand column for posts dealing with specific populations.